It’s been a month already since I completed my first Bataan Death March (BDM) 102km ultra marathon and I have not written about it. I must have enjoyed myself recuperating from it and enjoyed longer sleep which I barely had during the training season prior to the race. One of my goal this year was to finish the BDM 102km. Another crazy idea, but I guess I have established already that whatever I put my mind into, I’ll make sure that I’ll work on it and eventually achieve it. I trained for 12 weeks for this event and have really focused on improving my mileage. I was glad that I was free from any injury and I hope it stays that way. Deciding to do the 102km was obviously to test our endurance and mental toughness. 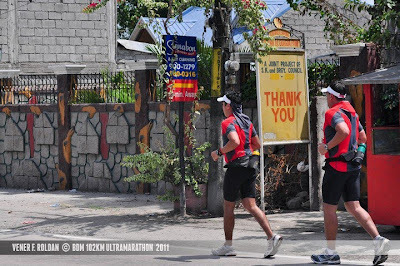 Considering that the farthest I ran was 50k (PAU T2N) in November last year, there were a lot of unknowns on this race. We have not simulated the whole 102km distance during training and just relied on the back to back long runs on weekends where some weekends were skipped. We were not able to do the two test runs prior to the race to familiarize us with the route. Not sure what the condition is after 50km and how my body would respond to 18hrs of running and walking. But I felt that I was prepared and I thought that the mileage I put in training was enough to take me to the finish line. Jay and I initially planned to do 15hours, but we were not sure if this was an aggressive or conservative estimate, we didn’t know. But it is important to set a goal so that you’ll have a clear direction on where you are going and what you will do along the way. Theoretically, we have set our planned pace to hit 15 hours, not knowing the real condition, we thought that it can be done. But reality steps in that this was a 102km ultra marathon and not a marathon. Though it was good to put a target but it has to be realistic. Respect for the distance was very important especially that it was the first time to conquer it. So we changed strategy and had a comfortable pace to cross the first half of the race as we know how to manage that distance. Then it was a total different strategy in the next half of the race (more of that later). Prior to the race, we have not really thought about our support group. As a default, Jay’s wife will be there to support us together with a driver, my wife can’t come since she is pregnant and not allowed to travel. 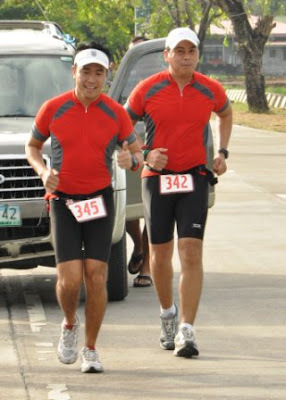 One day I was glad that my friend Mike Dauden (aka the transformer) and a GRC member volunteered to be part of the support crew together with Joey Cabanag who is from Balanga Bataan. Another GRC runner Cherry (who completed her 1st marathon in Feb) also volunteered to join. I have distributed to them the rules of the race so that the support group are aware of their roles during the race. Saturday morning at around 10:30am, we started to travel to Bataan. 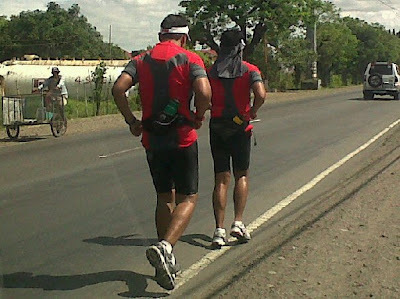 The plan was to meet up the rest of the support group (Mike and Joey) in Bataan where we are supposed to rest and prepare prior going to the start line in Mariveles. We arrived at Joey’s place at around 2:30 pm and we were welcomed with a prepared lunch. Food was great, we were kidding that it was like our last meal as we go to the bataan death march. I had coffee afterwards and since we have time, we took a nap to get some rest. For lunch: Tinapang Bangus, Tinapang Tilapia, Crab, Prawns, Papaya, Singkamas, and Ube Halaya. Did I miss something? We had at least 3 hours to sleep but I can’t sleep. I was thinking already about the race, was trying to visualize what’s gonna happen after 50km. I was also trying to psych myself up and try to maintain a positive mental attitude because I know at the end of the day, it will be all mental in the second half of the race. Went down and read magazines while drinking coffee (again!) at around 6pm. At 6:30 pm we started to prepare as we are to leave around 7:30 pm and head down to Mariveles at Km 0. Jay and I changed to our running gear and preparing or our stuff for the race. At km 0 with GRC support group. After the final briefing, singing of the national anthem and final prayer, the 142 brave warriors went off for the BDM 102 challenge. This race was also to commemorate our fallen heroes of Bataan during the World War 2. The first 6km was an uphill climb, as the strong runners went ahead, we decided to do walk breaks that early on uphills to make sure that we conserve our leg power. After that long uphill, we went running and tried to enjoy the course. Our support group had to leap frog every 5km in the first 50km of the race. Somewhere around the 49th km, Jay had to slow down and rested for awhile and he advised me to go ahead. I had at least a 2km lead I guess after that. But not for long, Jay catched up soon enough and waited for him at the next pit stop and saw me there eating banana. We replenished our hydration and off we went. Finally reaching the 60th km, we already passed our 50k mark and we still feel good. At km 70, can still afford to smile..
During this stage, Jay and I were not actually talking, this is where we felt the heat of the sun. The support group had to be there every 1km or less so that we can get water sponge to keep us cool. We were not complaining but we were conscious of the time. I began to feel pain in my hamstring and calves and I had to stretch once in a while. Our objective at this point was to finish within cut-off time. We were doing a run-walk strategy, we ran 500 - 600m then walk the next 400m. Everytime we see a km marker, all I would say was, "X km to go, almost there!" Had to maintain a positive thought so that we can make it to the finish line. Around km 80 onwards, it is where you begin to ask yourself, why am I doing this (but friends would start to ask this question from the moment we decided to do this, haha!)? It is important at this stage to at least manage to have fun while having to go thru the struggle of running this distance. Though you have to be physically fit, it is equally important that you are mentally prepared. Almost there! Can still smile (trying) no worries..
We were actually walking here, but there's a camera pointing at us, so better run and try to smile! hahaha! Finally at the finish line, we finished at 17:12:17. We finished at 78th and 79th place. We are very thankful with our support team. All support crews were very instrumental in every runner who joined this event. 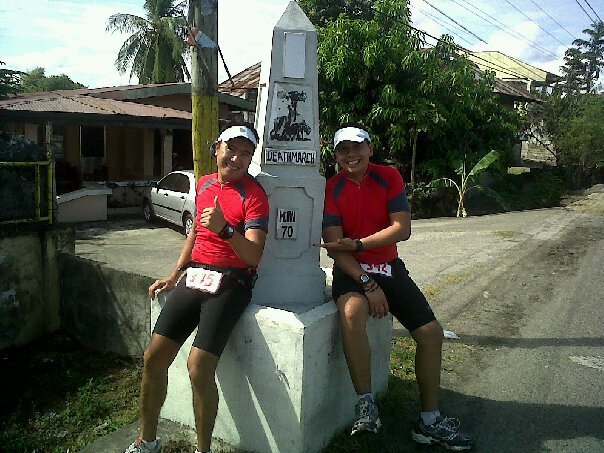 It was a great experience doing the BDM 102K Ultra marathon. It would seem to be difficult and impossible, but through preparation, discipline, and determination, everything is possible. pa-picture tayo ng magkasama ang Team GRC and Team Boring. Thank you bro! Yup, see you again in future races and let's have that group photo.. Nothing is impossible. Only the mind sets the barrier. But this is a very tough challenge. Really.